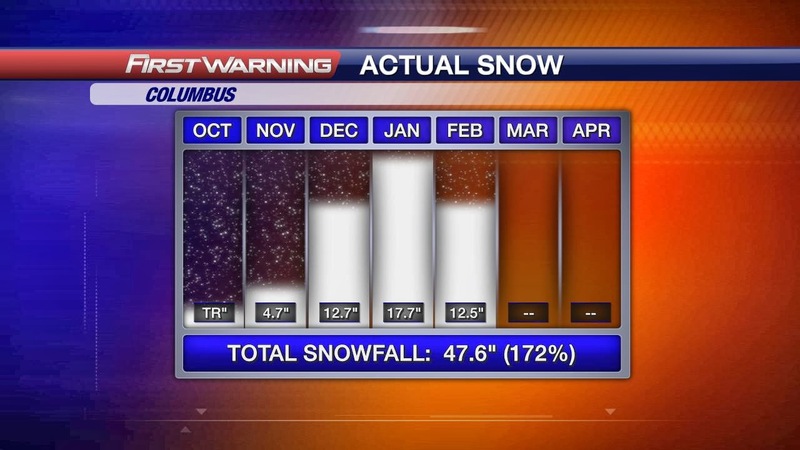 Thanks to the 1.9" of snow Columbus received today... we are well above average. Actually, we have had over a foot of snow since last Sunday. Crazy! So if we stopped right now with no more snow, we would already have received 172% of snow compared to normal. 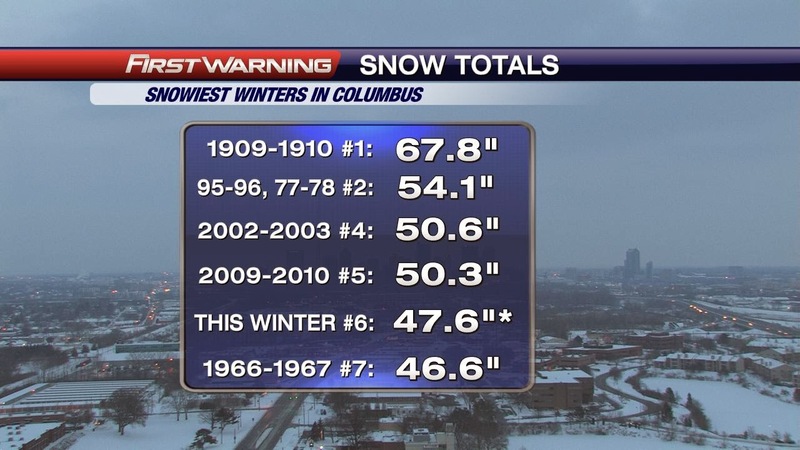 That bumps us up to the sixth snowiest winter we have had in Columbus. I EASILY think we will continue to climb that list... I mean shoot... Getting to #2 would only take another 6.5" of snow. I did my weekly USTREAM chat and I was asking about the roads out there. It seems that only one person said the roads were absolutely horrible. Most agreed that the main roads are fine, but the side streets are the bad ones. I am not surprised, but in the outlying areas and the hilly areas to the south and east, schools are already closing. We have over 40 delays, for Central Ohio schools, as well by 10PM the night before... and that list will continue to grow. Clouds slowly clearing overnight as flurries leave. Very cold by daybreak with temps falling back into the single digits and wind chills just below zero. Clouds continue to clear Monday with more sun later in the afternoon and remaining cold through the first half of the week, but trading off the cold temperatures with some sun. Tuesday and Wednesday will be very cold in the morning with lows near or just below zero with light winds. We slowly warm up heading into the end of the week as more snow looks to return. Right now the snow is looking pretty light for Thursday night-Friday morning and it continues to weaken for Saturday night as well. I will keep an eye on it and keep you posted. Have a good one!